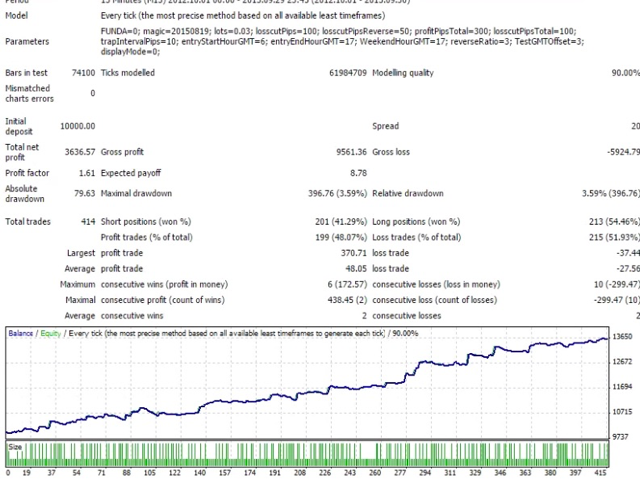 CycleTrapBand is a fully automated EA for Forex trading. This is a trend-following EA summing up the profit and loss of trend and hedge positions. This EA is using Bollinger Bands. The EA works on M15. The target currency is GBPJPY. It closes out on weekends. It is not recommended to use the EA if STOPLEVEL on GBPJPY exceeds 10 pips. FUNDA - buy and sell if "0", buy only if "1" and sell only if "-1". magic - set a magic number. lots - set a number of lots of trend position. 0.01 means one thousand of a currency. losscutPips - set a loss cut in pips on the trend position. losscutPipsReverse - set a loss cut in pips on the reverse position. profitPipsTotal - set profit in pips summing up the profit of the trend and hedge positions. losscutPipsTotal - set a loss cut in pips summing up the loss cut of trend and hedge positions. In some cases, a closure is performed by an internal logic. trapIntervalPips - set a stop level (in pips) exceeding that of securities companies. reverseRatio - set the ratio of the number of lots of a hedge position for the number of lots of a trend position. For example, if the number of lots of a trend position is 0.01 and the number of lots of a hedge position is 0.03, set the 3. TestGMTOffset - if you want to backtest, set the GMTOffset of historical data. In the case of the production operation, it does not need to be set because it automatically gets the GMTOffset of a server.